Words cannot capture the feeling of endless crimson hues of desert interrupted by the striking buttes, pinnacles and spires which form Monument Valley. The only way is to experience it for yourself. Monument Valley is quintessential American West. Made famous in John Ford’s many westerns, you may already recognize some of these stunning rock sculptures. Our scenic drive begins in Kayenta, Arizona and travels to Mexican Hat, Utah, but you can do this drive in either direction. The easiest way to reach Kayenta is from the US-89 and take the exit for US-160. As you follow the US-160, stop at Dinosaur Tracks (V1) just outside of Tuba City where you can see Jurassic-period, fossilized footprints. Near Tonalea, you will pass twin buttes, 5502 feet high, known as Elephant Feet (V2). Don’t miss a side-trip on AZ-564 to the Navajo National Monument (H1) which honors the lost tribe of the Anasazi. Within this monument are the state’s largest preserved cliff dwellings, self-guided trails and a museum depicting the life and culture of the Navajo. Located within the Tsegi Canyon system, the Anasazi built their cliff dwellings in the Navajo sandstone. Behind the Visitor Center is Sandal Trail, a one mile round trip hike to the canyon rim offering an incredible view of Betatakin’s ancient dwellings. The short Aspen Trail branches off to an ancient aspen forest view. In 82 miles from US-89, turn left onto US-163 where our scenic drive begins. As you leave the town of Kayenta, you will pass Chaistla Butte and the 6,825-foot Agathla monolith (named El Capitén by Spanish explorers) comes into view. These buttes were the hearts of volcanoes some 50 million years ago, but have since eroded. The vast landscape with surreal rock formations is a photographers dream. Stop at Boot Mesa and the eared Owl Rock next. Monument Valley comes into view and its expanse induces jaw-dropping oohs and aahs. Created by material eroded from the Rocky Mountains combined with the existing sandstone, the forces of water and wind work together to create this magical landscape. Shortly after crossing into Utah, Monument Valley Navajo Tribal Park (H2) is a short drive on Country Road 42B. Towering spires and pinnacles up to 1,000 feet rise from the flat valley floor. 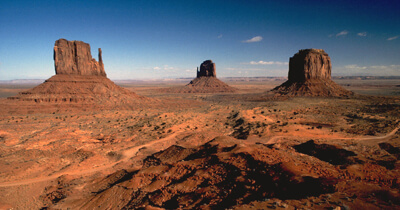 Explore Monument Valley with a Navajo guided tour operator along a 17-mile scenic route. Some landmarks can only be accessed by these tours but you can also venture out by yourself, especially if you have a high-clearance vehicle. Be sure to grab a map from the Visitor Center beforehand. One of the best times to visit is during the spring when the area is sparkles with wildflowers. Hike the Wildcat Trail, a 3.2 mile trial around the West Mitten Butte which begins just past the visitor center. Honoring the Anasazi people, the next stretch of US-163 drives through the heart of Monument Valley. Known as the Trail of the Ancients, the next 25-miles will leave you awestruck. Red rocks contrast against blue skies. Sage brush and cactus plants dot the red soil. Take advantage of the many pullouts. Our scenic drive comes to an end as you approach the town of Mexican Hat, so named for a rock sculpture that looks like an upside-down sombrero. From here, visit Gooseneck State Park (H3) where the San Juan River snakes through a canyon for 6-miles, isolating back and forth like a goose’s neck and continue to Muley Point (V3), one of its’ better viewpoints. Park entrance is free and features sweeping views of stepped cliffs and terraces. Muley Point is also one of the best free camping places in Utah. Not often visited, campers can pull over and camp at the cliffs edge. Or continue onto the Bicentennial Highway by heading north on UT-261 or continuing onto US-163, merging onto US-191 and starting the drive from Blanding. Either way, we recommend a stop at the Valley of the Gods (A1), a 17-mile dirt road featuring fascinating formations, beautiful red sandstone cliffs, buttes and precariously balanced rocks. The Four Corners Monument (V4) is also a short drive from here. From Bluff, head east on UT-162, continuing past the Colorado border on CO-41 and then heading south on US-160. The entire trip will take about 45 minutes and is the only place in the United States where 4 states meet (Utah, Arizona, New Mexico, and Colorado).